It’s been so long since I acquired this tea, I don’t even remember where I found it anymore. Although, to be honest, I know I bought it just for the lovely printed wooden box it came in. 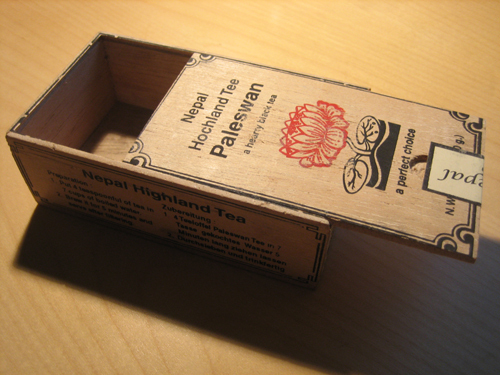 The pamphlet inside reads, “Himalayan Highland Tea Company” … out of Lewisville Texas. 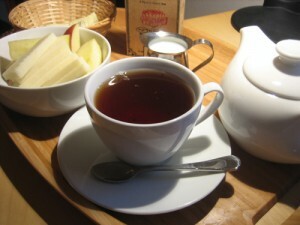 Regardless of the packaging and unconfirmed origins, it turns out to be a lovely tea. 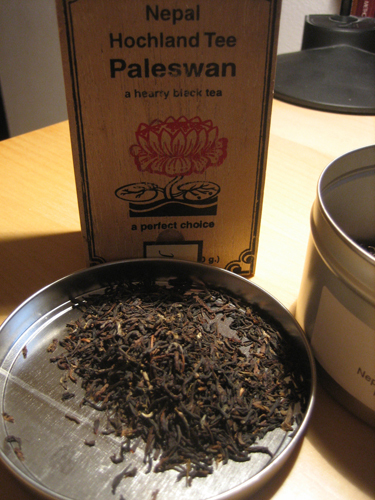 Paleswan is a hearty black tea grown in far eastern Nepal. 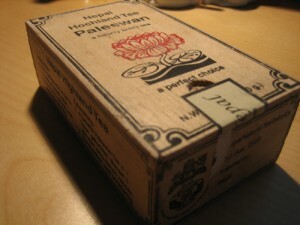 The included pamphlet describes it as “spicy, aromatic and full bodied without a bitter taste”. Interestingly enough, I thought the dried leaves looked a little “paler” than the darjeelings and assams I’ve been drinking lately and there was an abundance of golden color in the mix. The box suggests steeping four teaspoons in seven cups of boiling water for five minutes, but I decided to go with my preference for most black teas and steeped only three teaspoons for three minutes in water I’d brought to a roiling boil. A bit of Google research turned up one possibility for purchasing a similar tea: Highland Tea. Even the box looks similar. (My little pamphlet says the artwork on my tiny wooden tea chest is an illustration from The Complete Guide to Ayurveda by Gopi Warrier & Deepika Gunawan, M.D. copyright Element Books Limited 1997.) Unfortunately I could find little else on “paleswan” type teas other than the distinct impression that teas from Nepal are increasingly grown through sustainable agriculture, via cooperative farms and without pesticides. It’s definitely worth investigating a little more.